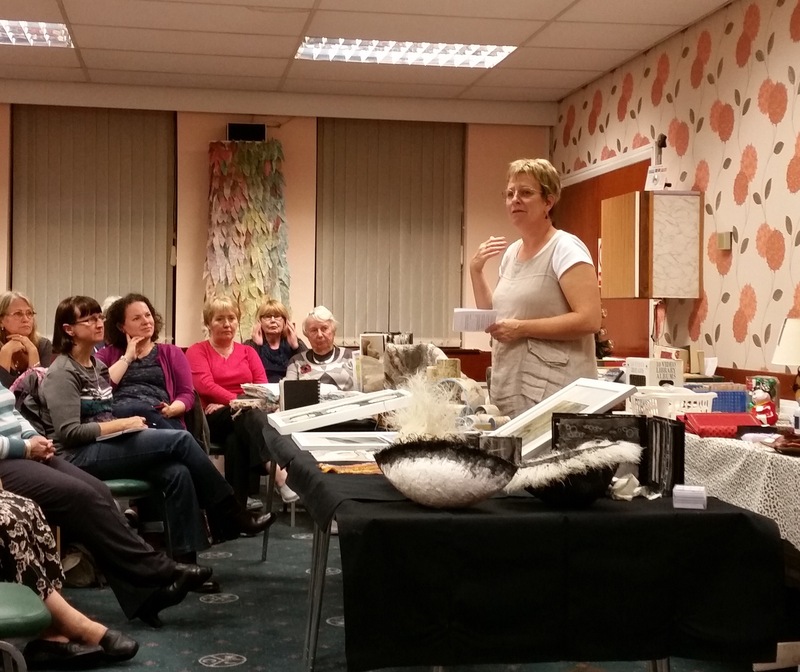 This weekend I gave a talk to the Halifax Embroiders’ Guild and Textile Group. We are all still in recovery. No, I jest! It was a real pleasure. I love that group – it’s full of the most amazing and talented people with just the right smattering of corporate craziness to light my world. It’s very inclusive and eclectic which in my case, is just as well. I have tried many arts during my life including embroidery, but when I stood up and said ‘Hello, my name is Rachael and I’m a textile artist’ it was a defining moment. It felt good. I’m now thinking of setting up Artists Anonymous. The title seemed obvious given my obsession with line and working on the various projects in recent years. I subjected the group to a brief life history and the threads that have been constantly weaving in and out of my arty endeavours including my helplessness towards vertical lines, layers and tones. There is nothing like giving a talk to help you understand yourself a little better and become aware of what is important to you. I then talked through my recent experience of Experimental Textiles and beyond to where I am now with the work developing under Hillstone Fibre Arts. 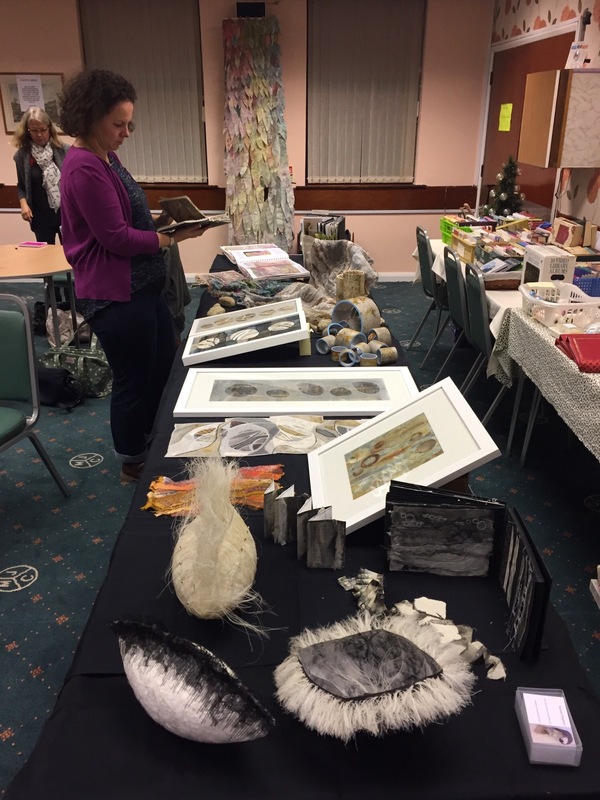 Life Flight (the feathers I did for my mum), Pebble, Atlantis and Noticeable Edges were all on display as well as my collection of sketchbooks. What a delight to see people enjoying my books in the way I have done with other people’s. I sat in the corner watching having a small out of body experience that this was actually occurring. Narratives which I hoped would be honest and respectful explanations about some of the pieces led to a few heartfelt chats afterwards. I have always enjoyed hearing the story behind a piece as it is if a curtain is drawn back and you can understand so much more than you did. Sometimes it’s enough to look and wonder and draw your own conclusions, and occasionally finding out more can be a disappointment if you have built your own meaning into something you enjoy viewing. But mostly, I find it a revelation listening to the artist and their intention. This time, it was me offering my intentions and I left reminded of the power that art has in holding us all together and in revealing shared experiences. More than that, my very small event on a dank Friday evening had quite an impact on me personally. I think it allowed me to recognise 1) more meaning in what I do than I had seen before 2) that others really did see me as another artist 3) that my work was good enough to be presented to such a group and 4) most people are really interested in the story. I’m still writing this little booklet of mine, and all I really want to do is inspire others to have a bash at something. It was a real joy to hear people come up and say, ‘I just want to go home now and play!’ Job done. I took a roll of teabag paper along and some of the samples for Manchester to pass round. After whipping up interest in the many uses of this lovely stuff, women of a certain age were seen leaving the town centre later that night with what appeared to be metres of outsized loo roll wrapped around their arms in a zombie-like fashion. I won’t be held responsible. I also got people to play with the possibilities of a long paper triangle in making something that would stand up. Rules were it couldn’t be folded or creased. Some people had one pin they could use to secure it. So many little lovely curvy shapes around the room. For me, one main difference between textile art and embroidery is the amount of possibility thinking that goes into it, and this was a good illustration. This was something I trialled at a summer school a while ago and I think I shall return to at some point. There is something left to explore about this feeling of being cocooned, wrapped and nurtured. My original thoughts were of cocooning personal wishes and hopes at the time (some of which have come to fruition) but as I write these words I have realised that there is a little life being cocooned and nurtured in my daughter, who we all have immeasurable hopes and wishes for. Oooooh, watery moment coming on…. My final revelation of the evening came when talking about my love of paper and finding out who else had the courage to ‘come out’ regarding their love of magazine sniffing. Yes. Really. I have several sisters who understand the moment you rip open a magazine bag and inhale deeply. Then, you open it gingerly to bury your nose in a middle page for another go. You can savour the smell for some time if pages are gently wafted. There was a greater percentage of fellow paper and magazine sniffers than expected in the room. I shall have to continue my studies of this. I like to think that in years to come I will have done my part in helping people accept that they are completely normal and can sniff away in public without recrimination. I still suffer some abuse from my work colleagues, although my boss now knows to bring in our educational journals in their bag, untouched. I get to have first sniff which is duly allotted a score out of ten. Well that stunned you, didn’t it?